You’ve seen it in countless movies and shows, watched its sports teams win big games, and probably even visited. But no matter how well you know the country’s most famous city, you can always learn a little more about the Big Apple. 1. THE TERM “THE BIG APPLE” ORIGINALLY REFERRED TO HORSE RACING. The city got its most famous nickname from a local newspaper’s horse racing column in the 1920s. Prior to the city’s adoption of the nickname, the phrase “Big Apple” was used to describe a big money prize at important horse races held around the city. 2. THE OLDEST BUILDING IN NEW YORK CITY DATES BACK TO AROUND 1642. Called the Wyckoff Farm, the Brooklyn house was originally built in the 1640s by a former indentured servant. The house was inhabited by the Wyckoff family until 1901, was named an official city landmark in 1965, and now functions as a museum dedicated to the city’s Dutch heritage. 3. BIRDWATCHERS HAVE SPIED 275 SPECIES OF BIRDS IN CENTRAL PARK. New York City is home to more than just pigeons, and Central Park is an amazing place to bird watch. Out of approximately 800 known North American bird species, 275 have made appearances in the park. Bird watchers have been known to spot up to 100 species a day during spring migration. 4. NEW YORK CITY TAXIS WERE ORIGINALLY RED AND GREEN. The yellow cab is one of the most recognizable symbols of New York City, but the first gasoline-powered cab company, founded in 1907, actually used red and green cars. 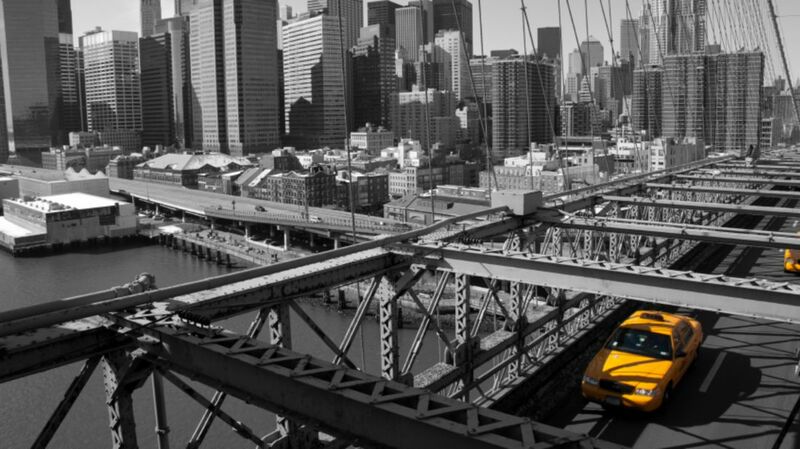 In fact, yellow cabs were used in a number of other cities throughout the United States before New York adopted the color in 1912. 5. NEW YORKERS SPEAK APPROXIMATELY 800 LANGUAGES. Over 37 percent of New Yorkers were born in another country, so it’s unsurprising that the city’s residents speak a wide range of languages—but by any account, 800 is impressive. Plus, some of the languages, like Quechua or Garifuna, are extremely rare or dying out even in their countries of origin. 6. THE FIRST AMERICAN PIZZA JOINT OPENED IN NEW YORK CITY IN 1905. Pizza is probably the food most frequently associated with New York City. Italian immigrants introduced the delicious, cheesy snack to the city all the way back in 1905, and New Yorkers have never looked back. Today, there are approximately 1,600 pizza restaurants in the city. 7. COWBOYS USED TO PATROL 10TH AVENUE IN MANHATTAN. Most of us associate cowboys with the Wild West—not the West Side of Manhattan. But from 1850 to 1941, New York’s 10th Avenue had its own special team of cowboys. Responsible for wrangling people rather than cows, the West Side Cowboys would ride on horseback ahead of the freight trains that ran down the middle of the street, warning people to get out of the way. 8. ITS POPULATION DENSITY IS THE HIGHEST OF ANY AMERICAN CITY. New York isn’t known for its shoulder room. With over 27,000 people per square mile, it’s not just the densest major city, it also accounts for more than 40 percent of New York State’s entire population. 9. IT WOULD TAKE APPROXIMATELY 24 HOURS TO NAVIGATE THE ENTIRE SUBWAY SYSTEM. And that’s if you’re in a rush. With 34 lines and 469 stops, the New York City subway system is one of the largest urban mass transportation systems in the world. Traveling to every single stop (without leaving the transit system) will take you at least 21 hours and 49 minutes—traverse the whole system in less time than that, and you’ll have broken the current world record. 10. THE BRONX TAKES ITS NAME FROM ITS FIRST EUROPEAN SETTLER. Jonas Bronck, who moved to America from Sweden in 1639, was the first European to settle in the Bronx. His farm, covering about 500 acres, was referred to as “Bronck’s Land,” and the river was called “Bronck’s River.” Over the years, people started calling the whole area the Bronx. 11. STATEN ISLAND ONCE TRIED TO SECEDE. In the 1980s, frustrated with limited representation on the City Council, Staten Island politicians began campaigning for secession from the rest of New York City. These activists wanted to become the independent City Of Staten Island. But while the majority of Staten Islanders supported the campaign, the City ultimately voted against the secession. The secession campaign has been briefly reignited a few times since it was officially rejected in 1993, but Staten Island remains a New York City borough. 12. THE STATUE OF LIBERTY WAS DELIVERED IN 350 PIECES. Housed in 214 crates, the Statue of Liberty arrived in New York City in 1885 in 350 pieces. The statue’s iconic arm, meanwhile, actually arrived in the states a decade earlier, in 1876, where it was put on display at the Centennial Exposition in Philadelphia to raise money for the construction project. 13. THE MALL IN CENTRAL PARK WAS DESIGNED TO LET THE WEALTHY SHOW OFF. Formerly called the Promenade, the Mall is a quarter-mile path that cuts through Manhattan’s Central Park. It’s the only intentional straight path inside the park, and it was originally built to let wealthy New Yorkers stroll, socialize, and show off their Sunday best. 14. UNTIL THE 1920S, EVERYONE MOVED APARTMENTS ON THE SAME DAY. From colonial times through the beginning of the 20th century, May 1st was Moving Day in NYC—and nearly everyone who needed to move apartments did so on that day. The custom caused chaos and traffic jams as the streets became clogged with horse-drawn moving vans and furniture. Fortunately, this odd practice began to die down in the 1920s, and of course, modern New Yorkers can move whenever they want. 15. THE PRICE OF A SLICE OF PIZZA AND THE COST OF A SUBWAY RIDE ARE ALMOST ALWAYS THE SAME. As far back as the 1980s, New Yorkers have observed a peculiar economic law: The price of a pizza slice and a ride on the subway are approximately equal. Even stranger, if the price of one goes up, the price of the other usually follows within a few months.